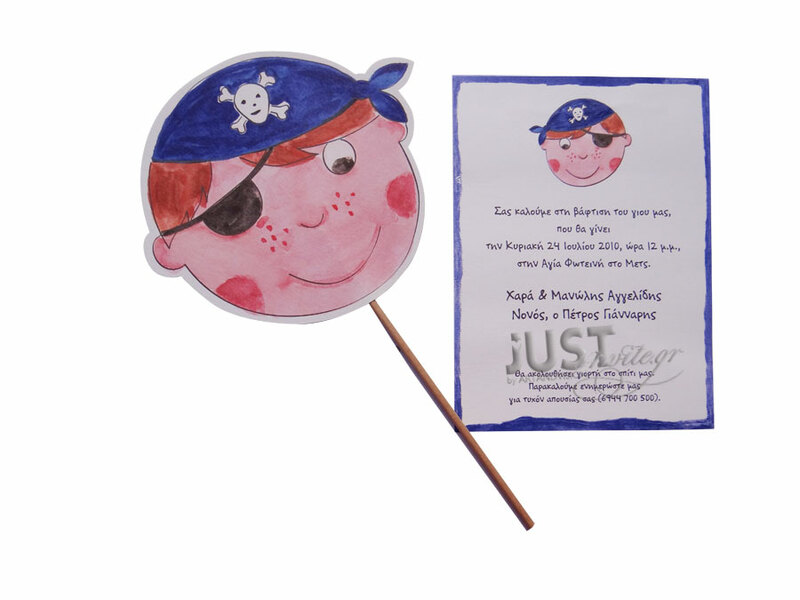 Greek Christening invitations pirate theme in handmade stick style for your baby boy. A pirate pattern attached on a stick coming in a white insert with your personalized wording. The design is finished with a blue satin ribbon and your bespoke invite is printed in plain grey colour. Height: 30 cm. https://www.preciousandpretty.com/2017/04/pirate-theme-christening-invitations-stick-style-for-greek-baptism-C1911.html Greek Wedding Favors|Orthodox Crowns|Stefana|Baptism Invitations Pirate theme Christening invitations stick style for Greek Baptsim C1011 Christening invitations pirate theme in stick style for boys Product #: Greek Wedding Favors|Orthodox Crowns|Stefana|Baptism Invitations_301330435634744870 5 stars out of 5 reviews.